Blisters are a symptom of many diseases. Severity presence of blisters are linked to the presence of other symptoms, causes blisters and an important element is the location and blistering time factor. It is quite obvious that the blisters formed on the soles after prolonged process are totally harmless finding which requires only krytby tearing blisters, purification, and covered with tape.Interventions physician in any event is not required, the patient can help himself. 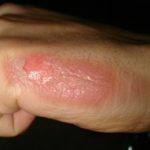 Blisters can develop as a manifestation burns second and higher level. It depends on the area and location of the damage, if given proper first aid, if it is an adult or a child like. If a person burn (capsizes at each boiling liquid – for example), it is necessary first aid – firstly removing clothing,that is struck, deletes all chains, and the like ornaments (if possible), and the longest time cooled under cold running water (half an hour). If this is severe, a doctor should be called – to his arrival to try to cool the affected areas. Blisters, which coincide more bulls are really a symptom of a wide variety of skin diseases. Their prognosis is very diverse. 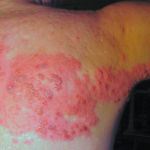 Examples of serious and life-threatening illness is toxic epidermal necrolysis – formed blisters, bullae, then there is a separation cárovitému leather. This condition usually follows a severe reaction to the drug. Man serious disease know very soon, seek help. 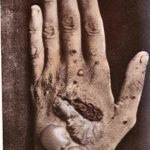 If there is blistering (except for blisters on the soles and palms under mechanical stress of the skin), when the disease progresses, the condition worsens, or blistering long remain – it is advisable to visit a dermatologist – may be a completely harmless disease, but the disease severe. Most of them, however, can be therapeutically managed. Blister Otherwise also pressure blister, traumatic bulla, epidermolysis bullosa Traumatic Causes blisters Signs and symptoms of blisters Treatment blisters Bunion, more precisely pressure bunion is a very common disease, which in varying degrees of intensity affects virtually the whole population…. 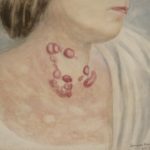 Description of porphyria Porphyria represent a very rare metabolic disorder of red blood cells, which in most cases inborn. Excluded but neither subsequent disease by this disease. The name of the disease originated from the Greek word “porphyrus” – purple…. Description pemphigus Pemphigus is difficult to treat, recurrent autoimmune bullous disease affecting the skin and mucous membranes throughout the body. It exists in several different forms, which differ in their manifestations, its localization, time of creation and by whom affect….